Marc Newson (b. 1963) "Voronoi", 2006. A white carrara marble shelf. Estimate: $150,000 - $200,000. Photo: Christie's Images Ltd 2009. NEW YORK, NY.- On Tuesday December 8, Christies 20th Century Decorative Art & Design sales will showcase the entire range of 20th Century Decorative Arts, from Art Nouveau, Arts & Crafts, Art Deco, to the Modernist and Contemporary movements in three separate sales. The auctions featured are: Important 20th Century Decorative Art & Design, Magnificent Tiffany Featuring The Gluck Collection, and Historical Design Reflects: The East 61st Street Years. With over 400 lots in three separate sales and a sale total expected in the region of $9-14 million, the auctions create a comprehensive review of this rapidly expanding market. Christies Important 20th Century Decorative Art & Design sale will offer the largest selection of works to come to auction by the creative powerhouse couple François-Xavier and Claude Lalanne. The 52 works presented in the catalogue are expected to achieve $1.9-$2.9 million. Within this group of 52 works is the largest single-owner collection to come to market with 49 prime examples from the Lalannes. François-Xavier and Claude Lalanne, or the Lalannes as they are collectively known, first attracted attention in Paris in the 1960s, through widely publicized commissions from Yves Saint Laurent and Pierre Bergé. Their source of imagery was the natural world, with Claude particularly fascinated by the textures and sensual lines of boldly scaled plants and François-Xavier captivated by wild animals. The present selection will offer collectors the opportunity to acquire highly coveted pieces by the Lalannes, which bear their celebrated signature style. Among the highlights are two elegant large-scale works by François-Xavier Lalanne : Grand Wapiti, a patinated bronze elk designed in 1996 (estimate: $100,000-150,000), and a patinated bronze bear Grande Ourse (estimate: $150,000-250,000), designed in 1994. The collection also contains patinated bronze cheetah, Guépard, Tête de Coté, from 1994 (estimate: $60,000-80,000). The sale will offer two bronze and galvanized copper candelabra, Candélabre sur Pieds avec feuilles (estimate for each: $35,000-55,000) that were created by Claude Lalanne in 1999. A pair candelabra of the same model but with nine arm by Claude Lalanne graced the Rue de Babylone home of Yves Saint Laurent and sold for 145,000 euros this February at Christie's record-breaking Yves Saint Laurent and Pierre Bergé auction in Paris, where a world auction record was set for a work by the Lalannes. Also featured in the sale are a pair of painted wrought-iron and marble chairs Oiseaux de Marbres (Grand modèle) (estimate: $30,000-50,000) and a matching low table (estimate : $10,000-15,000). A set of sold in the Yves Saint Laurent and Pierre Bergé Paris for 337,000 Euros. Other exceptional highlights include furniture by Claude Lalanne, including a fantastic Crocodile Banquette (estimate: $100,000-150,000), and a magnificent set of aluminum Gingko pieces featuring several chairs (estimate for each $15,000-20,000), a low table (estimate : $40,000-60,000), and a dining table (estimate: $50,000-80,000). The top lot of the sale is an important and ebonized wood and glass occasional table by the great Italian designer, Carlo Mollino (estimate: $250,000-350,000). This rare and sublime table is said to have been personally owned by Mollino. Christies set the record for a work by Mollino when a unique oak and glass table from the Casa Orengo sold in York for $3,824,000. The iconic Italian 1960s designer Joe Colombo will be represented in the sale by a pair of wool upholstered chromed-steel chaises loungues (estimate : $10,000-15,000) ; and a Dondolo fiberglass reinforced chaise by Cesare Leonardi and Franca Stagi will be offered at $12,000-18,000. 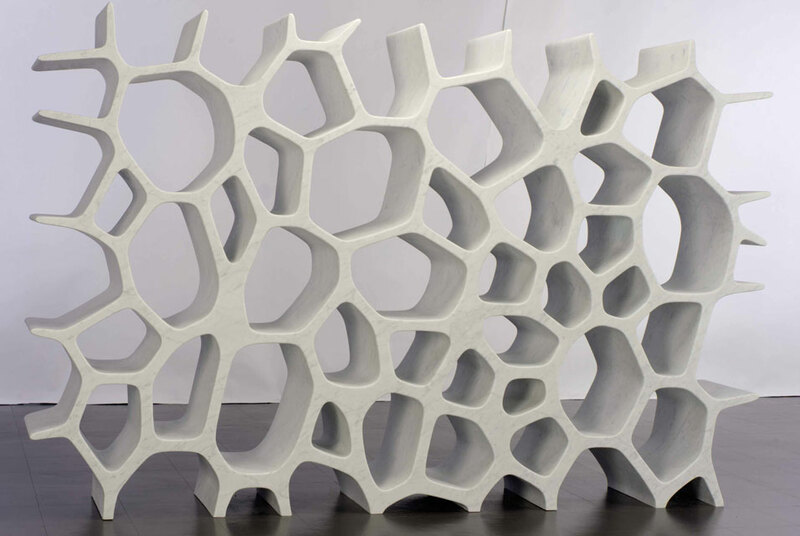 Of the contemporary offerings is a spectacular Voronoi white Carrara marble shelf from 2006 by Marc Newson (estimate: $150,000-200,000); a Campana Brothers stuffed toy animal and steel banquette chair (estimate: $20,000-30,000); and a delightful Verner Panton hanging light from circa 1970 (estimate: $50,000-80,000). Among the notable highlights is a superb wrought-iron and leather desk by Jean Michel Frank (estimate: $60,000-90,000), executed by Comte, Buenos Aires. Also by Frank are a set of leather upholstered armchairs (estimate : $30,000-50,000), and a mahogany low table (estimate: $15,000-20,000). An extraordinary highlight of the sale is a rare Jean Dupas painting from 1921, "La Femme à LAra", (estimate : $100,000-150,000) preparatory painting for a mural for the townhouse, Hôtel Daverne in Bordeaux. Its owner called upon other luminaries of the era, including Maison Daum, Edgar Brandt and Jean Dunand, to complete the modernist interior of the townhouse. The sale will feature an exquisite selection of glass, including an overlaid, etched and vitrified table lamp with applied snail decoration by Daum (estimate : $60,000-80,000) and an Emile Gallé Parrot vase (estimate: $30,000-50,000). Rounding out the sale will be a number of works by great American architects including a leaded glass panel by Frank Lloyd Wright from the Ward W. Willits House in Highland Park, Illinois (estimate: $8,000-12,000) and architectural and decorative elements from the Chicago Stock Exchange Building by Louis Sullivan and Dankmar Adler, such as a cast and wrought iron elevator enclosure (estimate: $15,000-20,000) and a stenciled ceiling panel (estimate: $25,000-35,000). A set of five George Washington Maher leaded glass windows from the Kenilworth Club, Kenilworth, Illinois will also be offered at an estimate of $20,000-30,000.